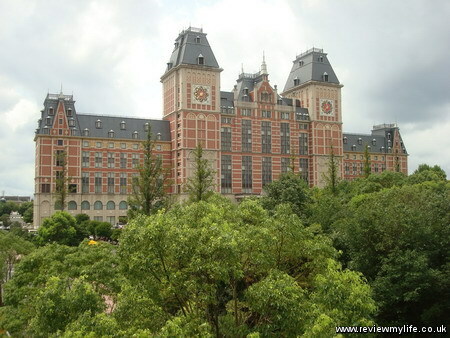 On the 14th August 2010 I was visiting Huis Ten Bosch in Nagasaki prefecture. As luck would have it this was the day that Japan’s entry into the Hanabi World Cup 2010 fireworks competition was being performed. It cost ¥500 for the ticket. Here are my photos and a five minute video of the event. 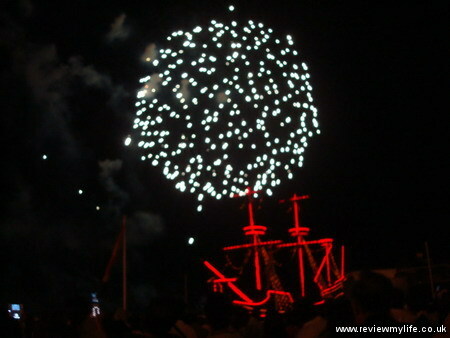 After the warm up fireworks display Japan’s entry into the competition began. 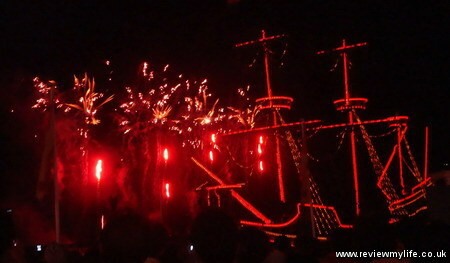 The backdrop was a Kanko Maru Edo-Era sailing ship lit up with red lights. 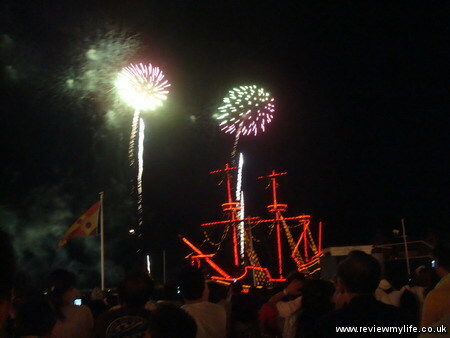 The fireworks were choreographed with the Eastern sounding music as well as a bit of rock. Watch the video at the end of this post to hear the music. 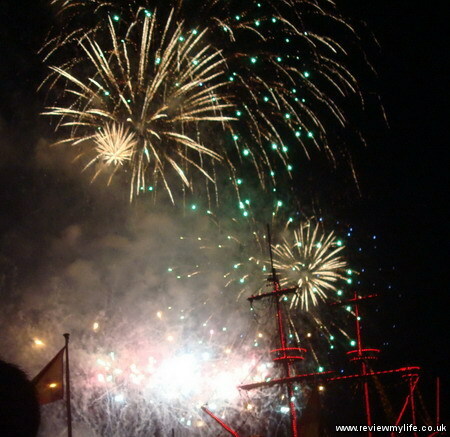 The beginning of the display was more subtle than a ‘fire everything into the sky at once’ display that you might get on bonfire night. 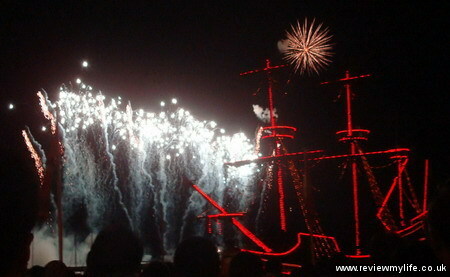 The title of this display is Hanabi ぜよ. 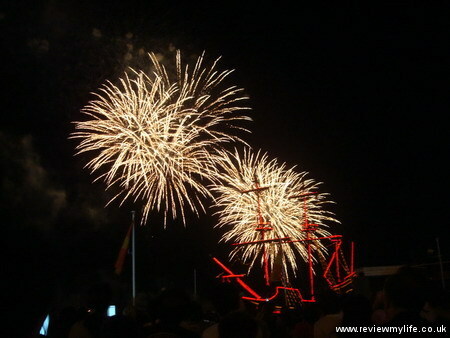 Also in the competition are China, Portugal, the U.S.A. and France. 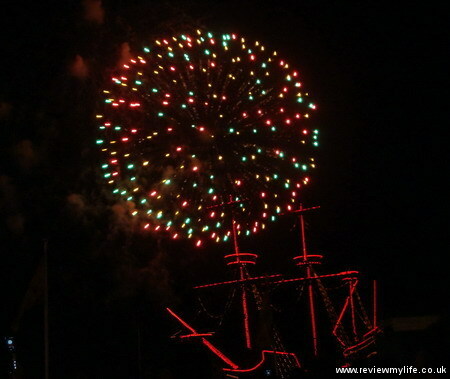 Hanabi is the Japanese word for fireworks. It translates as ‘flower fire’. This is the kanji for Hanabi: 花火. The first one ‘hana’ means flower 花, and the second one ‘bi’ means fire 火. If you look at the flower one you could imagine that it is a picture of some hanging flowers. And the second one looks a bit like a man flapping his arms around because he is on fire. Thinking of what the kanji look like makes them easier to remember. Being a fireworks display in Japan everyone was very polite, and sat on the floor in rows. 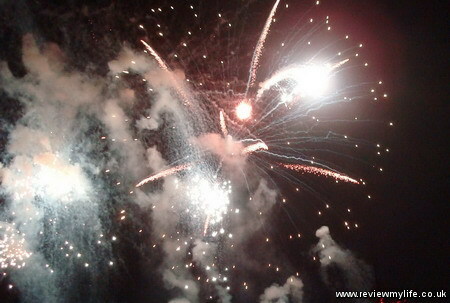 The spectators clapped and gasped at regular intervals, and there was lots of photo and video taking as well. 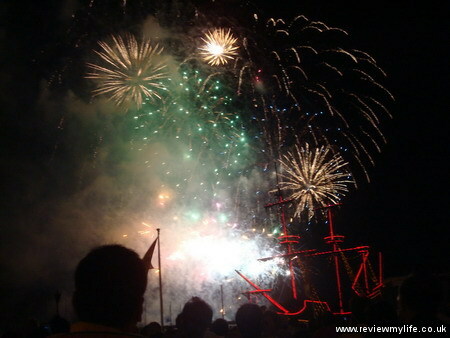 The finale was a massive ‘shoot as many fireworks into the sky at once’ ending. Always guaranteed to please the crowd. You can watch this in up to 480p if you change the settings on the embedded video. Fish eating my feet (photos and video)! 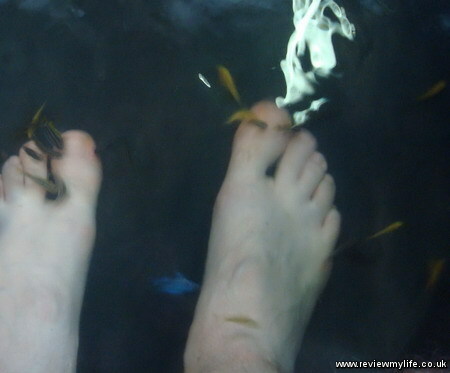 In Nagasaki I got a chance to have my feet eaten by fish! It isn’t as gory as it sounds, these are special fish that just eat the dead skin cells off your feet. They are known as doctor fish or nibble fish. 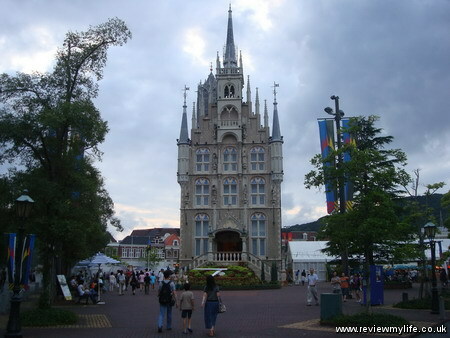 It all happened in the Huis Ten Bosch theme park in Nagasaki prefecture. There was a doctor fish foot spa there. It cost ¥800 for 10 minutes and seemed worth a go. First you have to wash your feet using a basin at the front. Then you get taken to the fish tanks. In the first tank were lots of small black fish swimming around. You carefully put your feet in (being careful not to hit the fish), and then the fish start nibbling at your toes and feet. With these fish the sensation was a bit ticklish. Certainly not painful and you wouldn’t know that they were actually nibbling you. After a few minutes the man running the foot spa decided I was ready for something stronger. He took me to another tank, this one containing bigger yellow and blue fish (you can see them in the video above). I lowered my feet in again and this time instead of a tickling sensation it felt like being poked with little pins. It didn’t hurt, but was a very different feeling from the first tank. After my 10 minutes was up I was given a small towel to dry my feet and then I was sent on my way. In the evening I had a look at my feet. They definitely felt softer and had less hard skin on than before. 10 minutes wasn’t enough to remove all the hard skin but it did make a difference. 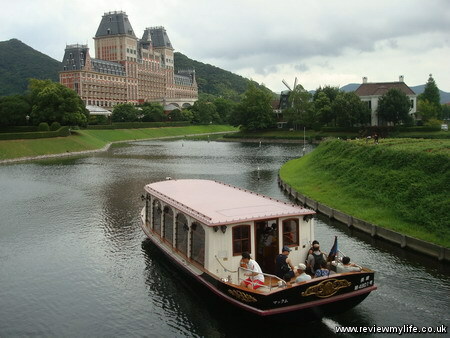 Huis Ten Bosch in Nagasaki prefecture is a place that has to be seen to be believed. 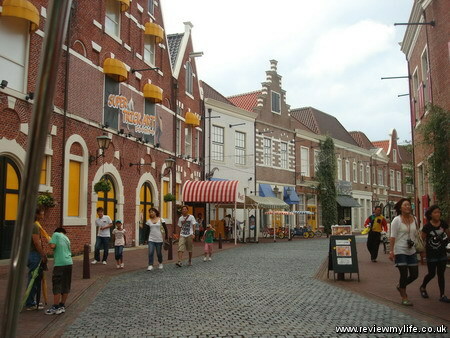 It is a theme park whose theme is Holland. 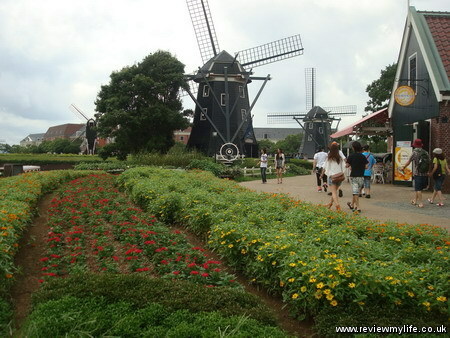 Here the Japanese have created an idealised version of Holland complete with windmills, red brick buildings and canals. 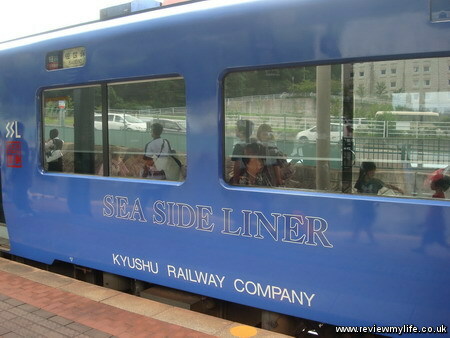 It is about one and a half hours from JR Nagasaki on the Sea Side Liner train. The return train tickets were ¥2500 each. They have a slightly confusing ticketing system. You can pay just for entrance, or you can pay for a Toku-Toku ticket that gives you discounts to the various attractions that are in the park. The attractions (virtual reality rides, mazes, Thriller museum, children’s adventure areas) didn’t particularly interest us so we just got the entrance ticket. Was still ¥3000 each, so not cheap! The entrance to the park is impressive, and so are the buildings inside. They have spent a huge amount of money on building a fantasy version of Holland. They spent so much that they had to file for bankruptcy in 2003. That is all in the past though, and today they are open for business. 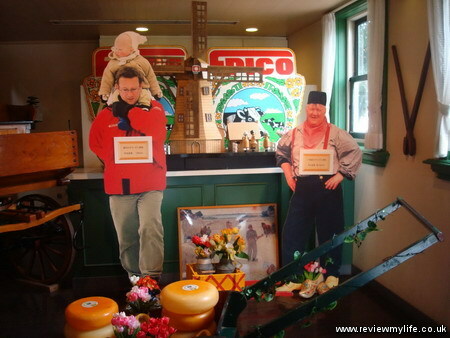 To help the Japanese understand what a Dutch person is they have some helpful cardboard cut outs near the entrance showing some ‘typical’ Dutch citizens. The one on the left has a sign on him explaining how tall Dutch people can be! The architecture and scale of the building is amazing. Below is one of the huge hotels that are on the site. There are a number of ways to get around the park. You can walk, take a boat, or hire a bike. Taking a canal boat costs ¥600 to go between the two stops (one near the entrance and one in the centre of the park). Hiring a bike, cart or tandem bike is a fun way to get around. To hire a two person cart for 3 hours cost ¥3000. If you want to hire a bike or cart you’ll have to get to the hire shop quick as they are very popular. The bike hire shop was the only place in the park where we saw a real Dutch person. There was a very tall Dutch man there looking after the bikes. 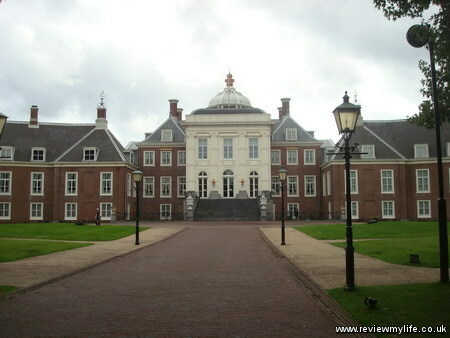 Huis Ten Bosch is named after one of the official residences of the Dutch Royal Family. 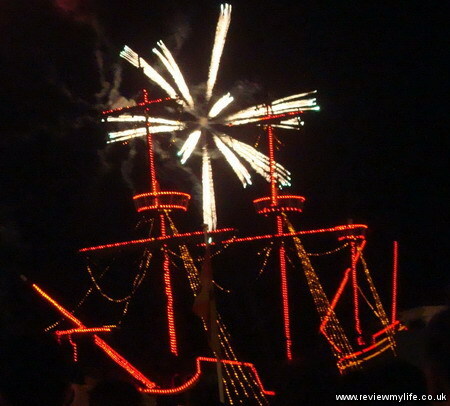 The makers of this theme park got permission from them to build a replica here. It’ll cost you another ¥500 to visit the palace replica if you have only bought the basic entrance ticket, but it is worth it. Inside they have tried to create royal looking rooms. 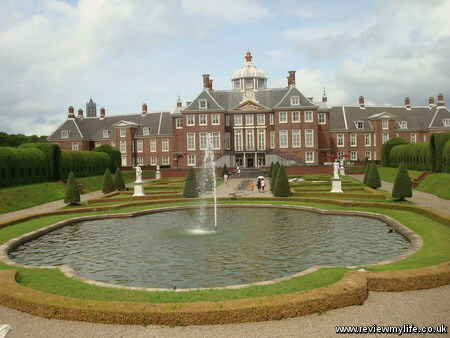 And there is an attractive garden behind the palace. Here is the view of the palace from the rear. Very impressive! Remember this is a theme park, not a real palace. Even with just the basic entrance ticket you can spend hours walking or cycling around the Dutch themed streets. There are shops and restaurants in the park, and other gardens, flowers, buildings and windmills to see. If it wasn’t for the thousands of Japanese people everywhere you could forget that you were in Japan. 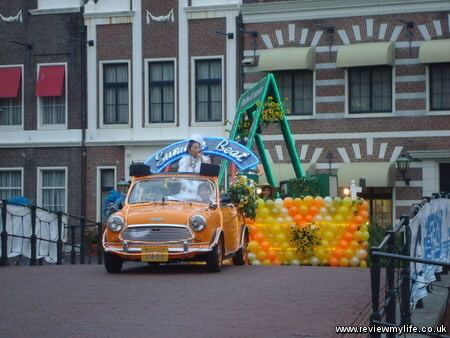 In the early evening there was a small parade of floats. Nothing like the scale of a Disney parade, but worth a quick look. 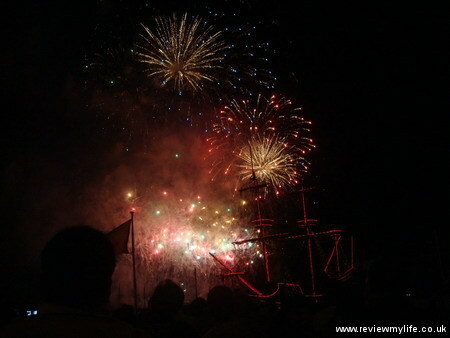 Also in the day we got a chance to let fish eat bits of our feet and in the evening was Japan’s entry into the Hanabi World Cup 2010. A very cool place to go if you have seen the city of Nagasaki and want to see something different in the prefecture.